A grieving couple draws a visiting tennis player into a savage charade where betrayal becomes its own redemption. 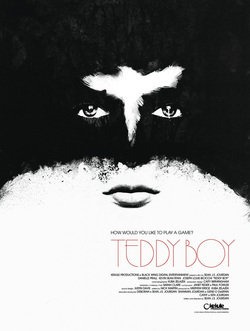 This entire week has treated me with a great run of indie films in queue, and "Teddy Boy" has been no exception. Save the cutesy sounding title, there's really nothing cute and smiley about this film, but it's a damn good one all the same. Sean Jourdan has crafted a strangely put together, but completely engrossing film, one that will easily eat away a little over 90 minutes of your time, leaving a strange numb feeling as the credits begin to roll. This movie has that "something" that makes it entertaining. That magical place where everything seems to work regardless of any and all minor flaws. It just becomes something that's "good to watch", with no other explanation needed. Filmmakers go to great lengths to try and achieve the flowing nature that "Teddy Boy" has accomplished. Was it intentional? Maybe, but in my experience, from talking to many filmmakers, it usually just happens. We can all try for it, but generally it just falls into place if all the correct elements are present, and you're lucky. By no means am I writing that "Teddy Boy" was a poor film that just happened to come together well, rather that this is a title that has the best of both worlds; as I wrote above, it's been a great week for me, getting a chance to watch a lot of excellent flicks. Normally, at this point I would begin ranting on the technical aspects of the film but in this case... I'm not even going to bother. Let's just say that "Teddy Boy" is not a poorly made film by any means. From production to post, everything is top notch in my humble opinion, and that includes the cast as well. The acting never feels hollow or shoddy, showing me the cast really took some pride in what they were performing. That pride translated perfectly to the screen, an excellent casting choice all around. What really struck me was the slow build of tension throughout the movie. Almost from the start, that uneasy feeling creeps in. You're waiting for something to happen, anything... and this continues straight till the last act. By the time something does happen, (no spoilers ladies and gents) you're a ball of nerves, just waiting. I attribute this feeling to the expression acting from the cast, as well as some great scoring. No matter how you slice it, "Teddy Boy" becomes quite a tense film; a big thing considering there's really not a lot of physical action. "Teddy Boy" is not a completely unique story, but original enough to keep things interesting. Throw in a great cast and some excellent, and at times unconventional edits... and you've got a real winner. There's something really great about a film, that is not a "shock scare" horror film, yet creates the same tense atmosphere. The open ended climax was also a great addition to leave the viewer... well, feeling awkward and wondering. Sean Jourdan has created a great film, no question. This is one I hope does really well, and one I'll be glad to add to my personal collection when the time comes.